As mentioned a while back, I've been working on a collaboration video for YouTube, and it went live today. It is a collaboration with Panzermeister36, whose YouTube channel some of you may already be familiar with. He specialises in 1/35 armour builds, and he has an amazing eye for detail and great artistic ability, quite a rare combination. 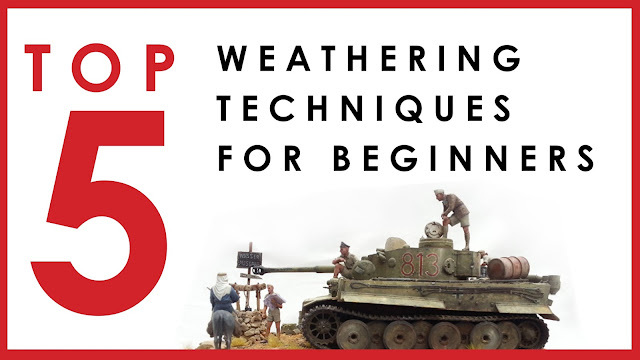 Our new videos are our respective takes on the Top 5 Weathering Techniques for Scale Model Beginners. Top 5 weathering techniques for scale model beginners. Each of us separately decided on our Top 5, and recorded our videos. The fascinating element is comparing the two interpretations, seeing which weathering techniques are so useful that we both agree on having them in our Top 5. Which are the most useful? Which are the most impactful (biggest bang for your buck)? Which are the easiest do Do-It-Yourself, without having to shell out big money for exotic materials? So please do check out my video below, and then scoot on over to YouTube to see Panzermeister36's video giving his take on the subject. Panzermeister 36's YouTube channel can be found here. And this is his collaboration video: "Top 5 Weathering Tips I recommend for beginners"
Great video. The oil wash is also my favorite weathering technique--I've used it for over 30 years. Washes work with acrylic paint and enamel paint as well, but oil seems to work best for me. You don't have to buy the most expensive brands of oil paint--the cheap stuff works just as well (sometimes better) for model washes. And a tube the size you showed will last darn near forever! Again, great video! Thanks for posting it. With the oil wash. was this done on enamel base paint? and also how do you get ride of the shine/gloss left over from the thinned oil wash? If you thin the oil wash with terps or mineral spirits, it doesn't really leave a shine. If it does shine, you can always spray some Dullcoat on it. I've never had a problem with shine, though.